In today's blog post we take a look at the overall market PE ratio over time. Have you ever wondered what the overall PE ratio of the market is when taking into consideration all the shares listed on the JSE and their various PE ratios? Well we provide a time series of the PE ratio of the overall market over time below. So is the overall market expensive based on its historical PE ratio? The line chart below shows the monthly average PE ratio of the overall market for the last couple of years. And based on the historical average of the market's PE ratio, of 16.59, the overall market is deemed expensive if purely looking at the current PE ratio of the market. The graphic below shows a bar chart which shows the annual PE ratio of the overall market from 2007 up to the current average PE ratio for 2018. 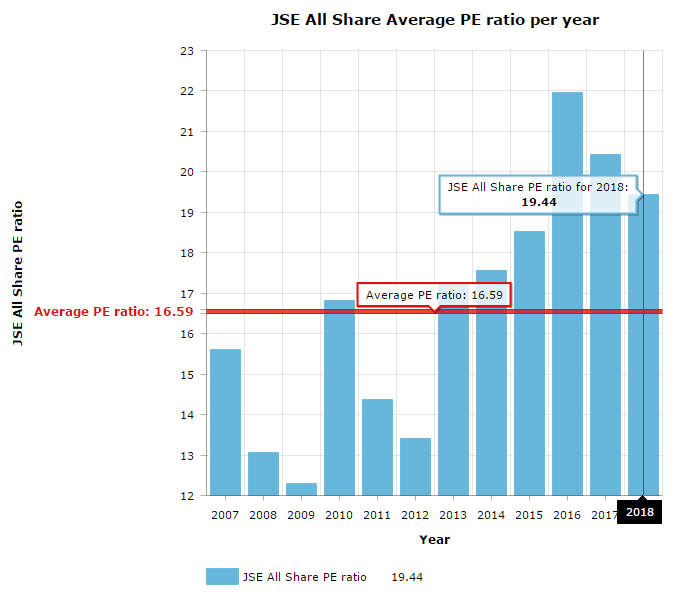 The bar chart above shows that the market has been trading above its long term PE ratio for a number of years now, in fact since 2013 the JSE All Share index has traded above its historical average, although in recent years it has slowly made its way back down to levels closer to its historical average. Investors should keep this in mind when buying into the market as a whole and not buying selected shares. The overall market is trading above historical valuation levels and therefore short term returns could disappoint investors. Sound advise would be to discuss this with a financial adviser and perhaps select a few quality undervalued shares instead of buying the market at this point in time.